WASHINGTON/DETROIT -- Volkswagen Group's nearly decade-old plot to cheat U.S. emissions tests -- all while marketing its diesel cars as environmentally friendly -- was quickly unraveling by 2015. A campaign to mislead regulators was failing so badly that top executives signed off on a script for employees to use when questioned. It didn't work. The next day, Aug. 19, 2015, an employee went off script and told regulators for the first time that its diesel cars were designed to behave differently during emissions tests, according to court documents. In the home office in Germany, some executives and engineers began deleting documents related to U.S. emissions and the company's head of engine development told an assistant to dispose of a hard drive containing emails from him and other supervisors. All this was laid out by U.S. prosecutors on Wednesday as they announced charges against five officials they said had been key to developing and carrying out the scheme. As part of the carmaker's settlement concluding criminal and civil probes in the U.S., VW agreed to plead guilty to conspiracy to defraud the government and consumers and obstruction of justice, and to pay $4.3 billion in penalties. Prosecutors continue to look into the roles individuals played and the investigation is still open, U.S. Attorney General Loretta Lynch said at a press conference Wednesday. Indicted with Heinz-Jakob Neusser, the engine development chief, were Richard Dorenkamp, who led the failed effort to design a diesel engine that would meet the tougher emissions standards the U.S. adopted for 2007 and appeal to drivers; Jens Hadler, who led engine development from 2007 to 2011; Bernd Gottweis, who was responsible for quality management from 2007 to 2014; and Jurgen Peter, who worked on Gottweis's group since 1990 and was one of VW's liaisons with U.S. regulators during the critical months when they were growing more suspicious. A sixth man, Oliver Schmidt, the company's liaison with U.S. regulators, was arrested Saturday as he attempted to return to Germany after a Florida vacation. Schmidt, also charged with participating in the alleged scheme, is scheduled to appear in court Thursday in Miami. Neusser and the other four are in Germany, and Lynch said it wasn't clear how their cases would proceed. In a statement, Volkswagen CEO Matthias Mueller said, "Volkswagen deeply regrets the behavior that gave rise to the diesel crisis. We will continue to press forward with changes to our way of thinking and working." A spokeswoman for VW declined to comment on the employment status of the men indicted Wednesday. Lawyers for Neusser and Dorenkamp didn't immediate respond to requests for comment. Representatives for the other men couldn't immediately be reached. The U.S. case against Volkswagen outlines an audacious scheme that was hatched in 2006 to sell more diesel cars in the U.S. despite the tougher emissions standards about to be adopted. It was an important goal for the parent company and Dorenkamp and Hadler were among a group designing a new diesel engine that was a cornerstone to what was known as the "US'07" project, according to the indictment. But they couldn't design an engine that met new emission standards while attracting new customers. So, despite concerns raised by some VW employees, they authorized the creation of software that recognized when the vehicle was undergoing testing and switched to more effective emissions controls, authorities said. On Oct. 17, 2007, a slide containing explicit engineering terms for the defeat device was passed around to Hadler and others, and he responded, in German, "We shall never present this anywhere and will also not distribute it," the U.S. said. A month later, Hadler sent an email to Dorenkamp that included photos of himself posing with California's governor -- then Arnold Schwarzenegger -- at an event where VW's cars were promoted as "green diesel." The plan began unraveling in 2014 after a laboratory at West Virginia University noticed startling disparities in VW's emissions tests. 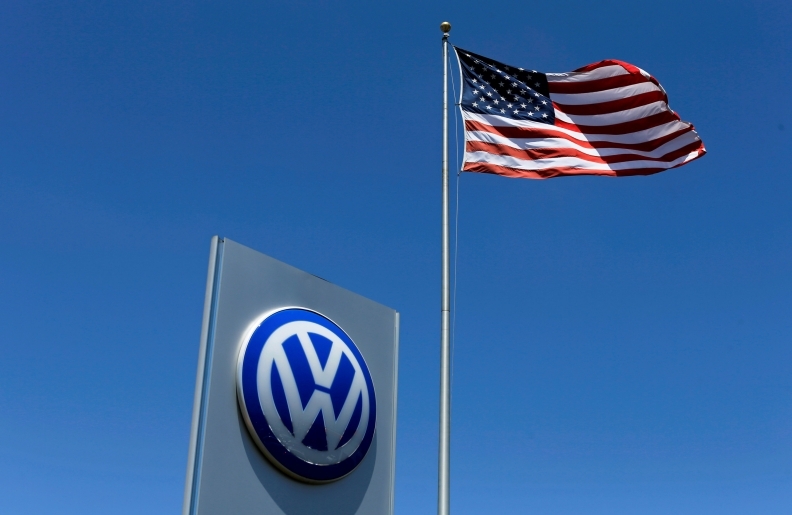 U.S. and California regulators pressed Volkswagen for an explanation, and Neusser, Gottweis, Schmidt and Peter "pursued a strategy of concealing the defeat device in responding to questions from U.S. regulators, while appearing to cooperate," according to the documents. In June 2015, Peter wrote to VW employees saying they needed to come up with "good arguments" to tell regulators asking about the emissions discrepancies. Schmidt had a chance that August, and in a meeting with a California environmental regulator, he blamed "irregularities" and "abnormalities" for the results. He later explained why he wouldn't bring other colleagues with him to those meetings: so they "would not have to consciously lie."